Purchased on the Acquisitions Fund, 1995. Florentine art market, 1986; Martello Collection, Florence (Nereo Fioratti), 1992; H.P. Kraus; purchased from H.P. Kraus on the Acquisition Fund in June, 1995. 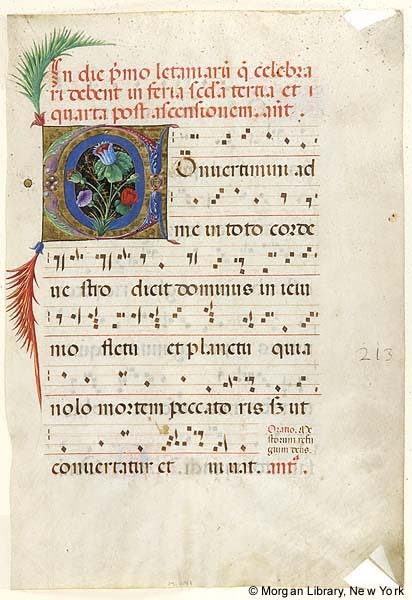 Ms. antiphonary single leaf, perhaps from an antiphonary of the Ambrosian rite; written and illuminated in Italy, perhaps Milan, ca. 1500. Decoration: 1 large illuminated initial C decorated with motifs of precious stones and imaginative floral representations. Artist: attributed variously to the workshop of Bergognone, or to that of the Master of the Arcimboldi Missal, the latter subsequently identified with Matteo da Milano by Jonathan Alexander. Text: music and text for the first of the Rogation Days which are celebrated on the 2nd, 3rd, and 4th days after the Ascension; after the rubric In die primo leteniarum que celbrari debent in feria secunda tertia et quarta post Ascensionem Domini. Musical notation: 4-line red staves with square notes.